Career planning is the ongoing process to take on roles and jobs to move you toward your career goals. It is the planned and unplanned accumulation of capabilities that add personal value. It integrates self-knowledge (personal needs and interests with an ideal outcome to create personal energy) with job market knowledge. It requires proactive decision-making and pursuit of experiences, assignments, jobs and potentially companies. I understand the career planning process and can develop a personal action plan that leads to a satisfying career. Career planning is a very personal, life-long process. A key goal is to match your life purpose, interests and abilities with the employment marketplace. Our life purpose can have a strong spiritual component that when aligned with our job and career goals can create “purposeful employment” and acknowledgement that our jobs are just a part of our broader life. Understand your life purpose and goals. Get to know yourself by assessing strengths, weaknesses, interests and work values (consider StrengthFinder). Complete the Career Planning Template below. Review the draft/completed template with a trusted mentor. Develop and implement an action plan. Career Planning Process. This builds on the career planning template below. Define life purpose and goals. Acknowledge that your job is just a part of your life (although probably a big one). Understand strengths and work values. Know and leverage your strengths. Consider one “weakness” area for personal development. Define career objectives. Where do you want to be in 5, 10, 20 years? Examples might be: own my own plumbing business in 5 years, become a Manager (level) in a purchasing role or find a non-profit role in Florida to be close to family. Think broadly if possible rather a very specific job. Define career goals. Examples might be: interview with 3 companies by January 1, master the skill of public speaking or achieve an annual salary of $60,000. Develop action plan. This plan should include delivery of exceptional results, skill acquisition, publicity, networking and mentoring. Update the overall template at least once per year of if something significant changes in your life. Give thought to potential obstacles and add plans to address them. Mentorship and sponsorship. Consider having a trusted advisor/mentor to review your career plan. This could be your manager but it’s helpful to engage someone who can span your work assignments. In a corporate setting, you might also need a sponsor, a higher-level manager who advocates for you. Career and job trends. Having a broad understanding of the economy and job marketplace, especially industries is an important knowledge foundation. Career planning is in part a prediction or anticipation of the future. Complete the below career planning template; review and improve it with someone you trust. How does your career goal fit with current employment trends? Are there sacrifices you need to make to achieve your career goals? What aspects of your work experience give you “energy”? See 15 Most Important Career Questions to Ask Yourself on CompareBusinessProducts.com for more questions for reflection. Work Values. They are the beliefs and ideas that are important to you and guide your actions. 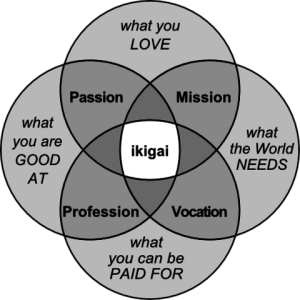 Article: 10 Tips for Successful Career Planning: An Activity for Job-Seekers of All Ages on QuintCareers.com by Randall S. Hansen, Ph.D.
Ikigai is a Japanese concept meaning “a reason for being”, on Wikipedia.com. Career Planning Tips and Techniques on YouTube by Sigmar Recruitment, about 2 minutes. Career Plan Examples: Career Development Plan Explained on YouTube by Job-Interview-Site.com, about 3 minutes. Be Successful: Career Planning (handout). Be Successful: Career Planning (with instructor notes).